Cuts steel of any dimension. All Steel Cutters are fitted with replaceable blades and a completely encased nose blade. The jaw’s design ensures that the material is forced deep into the jaw, where the cutting power is the strongest. All four cutting edges can be used. The jaw is equipped with an auto-guiding system. 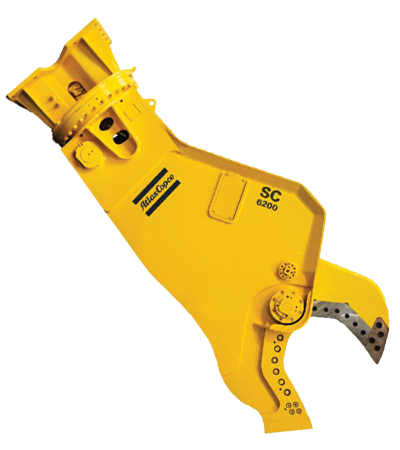 The SC range has a strong rotating headpiece, highly dimensioned with a double-rowed slewing ring. Between 16 and 65 t, depending on being stick or boom mounted (second or third member).